It’s taken ten-plus years for Nebraska to reach the big screen. Bob Nelson, a struggling sketch comic writer from Seattle, wrote the screenplay (his first) in between gigs on a dare from a colleague. Little did Nelson know that over a decade later, his script would be brought to life by one of the most respected writer/directors today: Alexander Payne (Sideways). 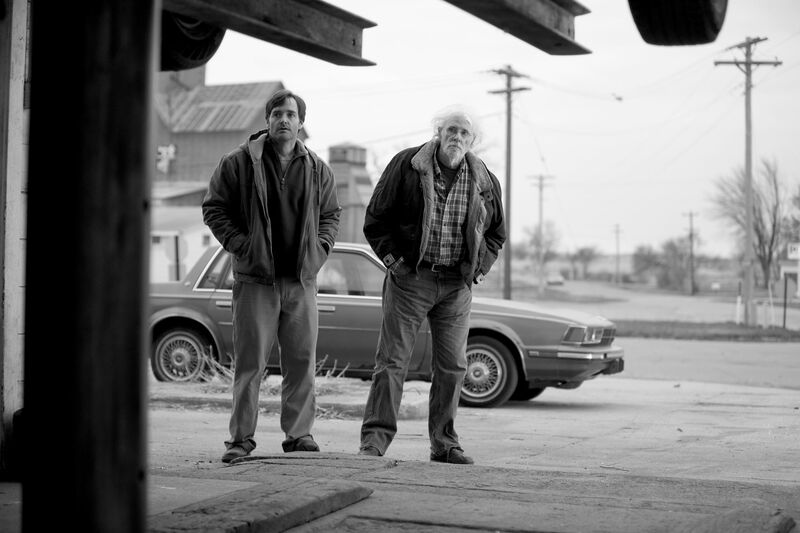 Now Nebraska is poised to receive award’s notice for acting, directing and even screenwriting. This doesn’t seem to have phased Nelson at all – who in our fifteen minute interview, seemed equal parts humbled and surprised by the film’s attention and success. In the following interview with screenwriter Bob Nelson, he discusses recreating Nebraska (the place) on page, his family’s reaction to the screenplay/film, the rewriting process, and the original scrapped alternate ending to the screenplay. For the full interview, hit the jump. It’s been a busy week for Nebraska with the New Beverly screening and the LA premiere at AFI Fest… How has it been touring and promoting the film? Bob Nelson: It’s been a whirlwind. I’m still in shock from it all. I never envisioned doing so much on the promotion side. But Paramount has put me out there and I love talking about the film. It’s almost overwhelming in a sense but on the other hand it’s great to see the reactions. You mentioned the LA premiere. I brought my mom down for that. What was her reaction to the film? Bob Nelson: Oh – she loved it. She’s actually in it for five seconds. Really? Who does she play? Bob Nelson: She’s Lady #1 walking to the salad bar in the karaoke scene. So she has her five seconds of fame in the movie. What’s been your family’s overall reaction been to the screenplay and the film? Bob Nelson: Pretty good. My brothers and sisters haven’t seen it yet – so we’ll see. I know they’ll be brutally honest. I have six cousins in Minneapolis who went to a screening of the film. I hadn’t seen them in years. But they got in touch with my mom and told her they loved it. Bob Nelson: Yeah… My relatives have the greatest senses of humor. Very dry wit. Very self-deprecating. They can take a little poking fun. The movie does seem to come from a deeply personal place. How much of it is based on real life experiences you’ve had? Bob Nelson: A lot of it actually. My family is from the Midwest. They moved to the Seattle area when I was very young but we went back a lot and visited. So a lot of it is taken from that. A lot of it is taken from my parents. My dad was the original inspiration for the Woody character. He was also a mechanic. A very trusting and nice guy. He [like Woody] would have his tools stolen all the time. I found out years later he was shot down in World War II and he never talked about it. The uncles that you see are very much like the uncles I grew up with. Hard working farmers. I borrowed as much as I could from real life to start the story out. I think that’s one reason my mom really enjoyed it. It’s a trip back for her. Bob Nelson: That’s right. When I was six weeks old, they got me out of there. But as I was growing up, we visited my relatives a lot down there. I loved it. My mother’s from a small town and my father’s from a farm just out of town – so I would get the small town ‘home feel’ and then get to stand out on the farm. I thought it was great. I was a little upset with my parents for moving. 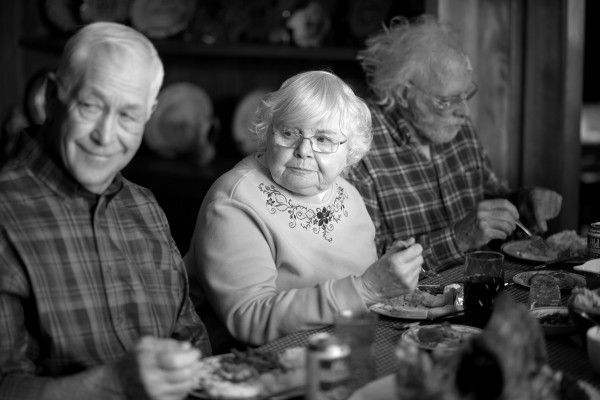 It strikes me Nebraska’s as much a character in the film as anybody else. How do you go about recreating this place on the page for the screenplay? Bob Nelson: I did little descriptions in my draft. I was excited when I was writing it because it’s an area you don’t see much on film. I tried to give little descriptions of the town and the farms and the people. But Alexander [Payne] did an un-credited rewrite of the script and he added to that. Then when we he went out to shoot, he scouted locations. He’s from Nebraska – so he already had a head start there. How much did the screenplay change from your drafts to what’s on the screen right now? Bob Nelson: I see quite a bit of Alexander in it. Watching it now, quite a few of his lines are in there. He did a lot of work on Act One. It’s probably at least half his now. Maybe more. But the basic structure, plot, scenes and characters are all still intact. Alexander definitely took it to another level. I can give an example: in my first draft, the David character works in a cubicle and you don’t even know what he does. And Ross is an insurance salesman. Alexander changed both their professions to give them a little bit of a sibling rivalry. A little bit of a conflict so that when they have their moment together later on with the air compressor, they have an [arc] too. So things like that really made a big difference. In my first draft, they didn’t go to Mount Rushmore. That was an Alexander addition. Coming to take the photograph and having the thirteen-year-old boy be the photographer was all Alexander. In every scene, there may be an Alexander line or two there. It’s been great. You always have this dream as a writer to collaborate with the best and I fulfilled that dream. Going back to the beginning – how did the script get into Alexander’s hands? Bob Nelson: I worked in the Seattle television industry. Bill Nye the Science Guy started out on the same show I did: a sketch show called Almost Live. [Bill] came back to do a short program called The Eyes of the Nye for the local PBS station. A producer named Julie Thompson came up to help work on that show. I told her I’d written this script and she asked to read it. She told me she knows this guy named Ron Yerxa [producer on Election and Little Miss Sunshine] through a charity and this might be the kind of story that would interest him. She got it to Ron. Ron showed it to his partner Albert Berger. The two of them decided to send it to Alexander basically asking if he knew of any up and coming directors maybe from the Midwest who would understand these people and this story. That’s when the big shock came back: Alexander said he’d like to do it someday. 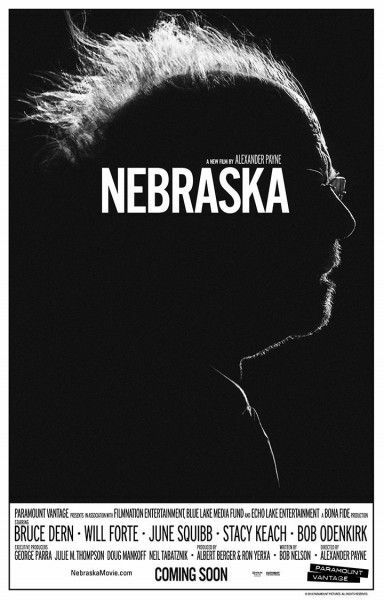 Nebraska is your first written screenplay. When did you start writing it? Bob Nelson: I wrote it in 2002. It was put out to those producers late in 2003. I had just finished writing it before Bill Nye called and asked me to work on his show for a year. What was the impetus for writing a screenplay? I know you have a background in sketch comedy – why a feature? What made you settle on writing a drama as opposed to a comedy given your background? Bob Nelson: I worked in writing sketches and jokes, but I grew up with Horton Foote and John Updike. I had always wanted to come up with an idea that’s as much (if not more) drama than comedy. This one seemed like it would fit the bill. [Plus] when Kit told me to write a screenplay, this was the only idea I had. It gave me a chance to write drama but I could also fall back on what I’ve learned about writing comedy. So it seemed like the right one to do. In fact: it was the only one I had. Given that you had never written a screenplay before, how did you go about structuring and outlining Nebraska? Bob Nelson: Well — I just jumped into it. I wrote twenty pages and came to a complete dead stop when I realized I didn’t know what I was doing. I had to stop for several months and educate myself. Read screenplays and really look at movies again in a different way. Look at story structure. Even then, before I jumped back into the writing process, I tried to come up with just about every scene in the movie and outline it. That’s when I was finally able to write it. Once I knew almost every scene, then I just wrote as quickly as possible and came up with my very first draft. That’s when the fun starts. Once you have the first draft, you can start rewriting. No matter how bad [the first draft] is, once you start reworking it, it’s going to get better in some way. How many rewrites did you go through on Nebraska’s screenplay? Bob Nelson: I wouldn’t call them rewrites. But after I did my first draft, I probably went through the script fifty times. The first two would probably be called rewrites. [I was] changing scenes around, cutting and adding things. But the last twenty or thirty times though was mainly refining it. Just challenging myself to find a better line here or there. And by the last couple, it was down to the spelling. How did the script change from those earlier drafts? Sure – go for it. I’ll put a spoiler warning around it. What sort of scripts or films did you look to as a blueprint for the screenplay? Bob Nelson: Horton Foote was always the one I looked to as writing these very realistic stories about real people. Tender Mercies. The Trip to Bountiful. But by that time, Alexander had come out with Election and I always loved The Coen Brothers. I loved Hal Ashby films. Billy Wilder films. The thing all of those films have in common is they’re able to successfully find drama in comedy. So when I sat down to write [Nebraska], I had all of those people in mind. It’s tricky. A lot of time people I know want a straight drama or a straight comedy, but I’ve always loved the ones that fall in between. Because to me that’s what real life is. 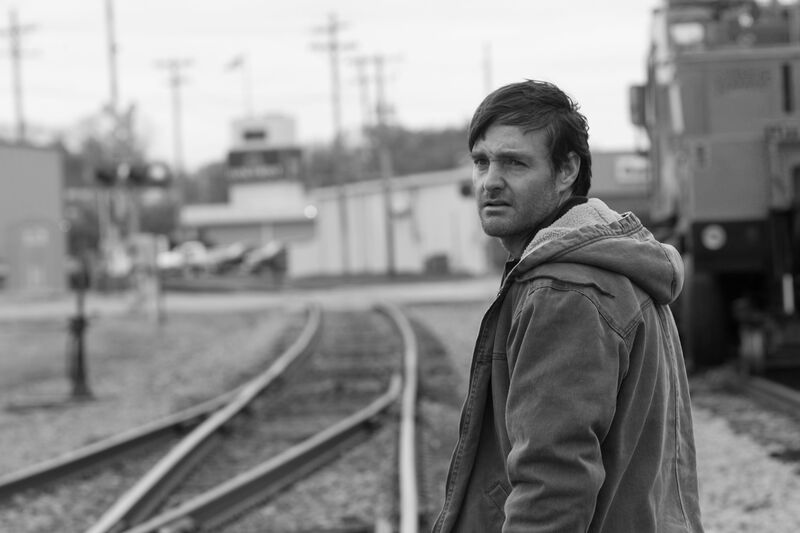 Nebraska is currently playing in select theaters.